Billy's Story: Billy was dumped at a vets in NW London in July 2018. He was underweight, flea ridden and neglected. The ex-owner confirmed that Billy had already had multiple owners who likely had social or addiction problems. Rescue Remedies offered a Rescue place, saving his life. Billy meets other dogs well. Billy is neutered, chipped, and fully vaccinated. Billy was in boarding kennels near Gatwick whilst awaiting his new family. Billy's progress through our Rescue is below. Billy has been surprisingly good with both large and small dogs and is very social with both people and dogs. He is fascinated by cats, and has tried to follow a few but just interested rather than perturbed by them. He has also had some nice interactions with a variety of people in the park and generally enjoys getting a stroke from other owners. I have been clicker training which is coming on well and he is showing much less anxiety on the lead as a result. He has also had some time on a long lunge lead in the early hours this morning and is getting the idea of recall. Generally he is much happier and more relaxed than when he first arrived, although has done a fair amount of anxiety chewing of objects in general as you would expect with any rescue and young puppy staffie cross. Weight wise, he now measures in at 26.4 on last weigh in, so has done very well. On first arrival he was only 22kg. He was 25kg of solid muscle when castrated but is now softening up a bit and seems more relaxed overall since the op. Billy is a young, lively boy who is understandably a little stressed at the moment having just arrived into our rescue. He gave Lynne and I a friendly welcome and was patient while we fitted a new disc to his collar and then he helped me put his harness on. He knew having his harness on meant we were going out for a walk. He was lively on the lead but he had a lot of energy and was keen to get out and explore his new surroundings. He sniffed and marked his way around the woods. Bless him, he did get a little impatient when I stopped to take some photos and he barked to tell me he wanted to get going again. He did however take his treats gently and politely. 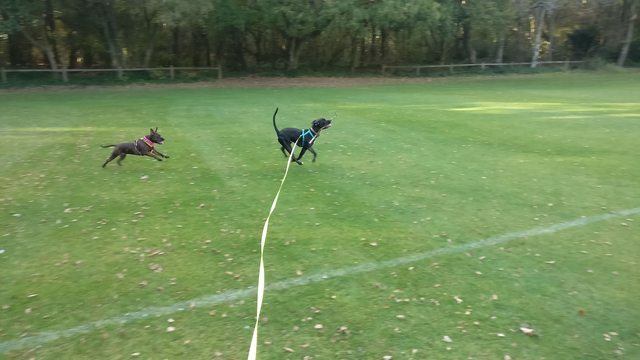 Billy helped me with a taster walk yesterday with a potential new walker - I got a lovely greeting in his kennel and we were quick to get harnessed up and Billy keen to get going ! Billy jumped up for a friendly hello to Helen and we were off ! We headed first to the big paddock where Billy enjoyed charging around and playing with (deflated !) footballs ! Fiona and I walked Billy today. He was keen to go and it took a little while to get him harnessed but I think that was just sheer excitement that he was going out. Billy walked well on the lead, he did pull a little but a gentle 'no' and he calms down. 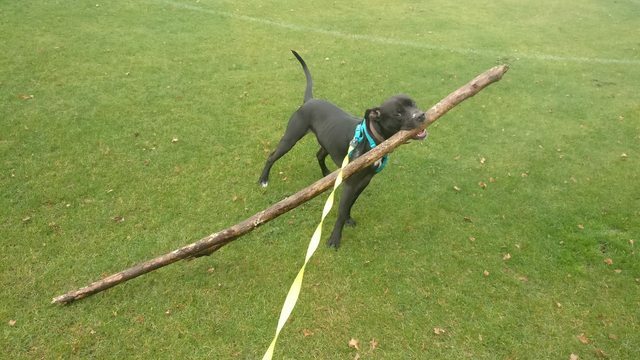 He sniffs everything and what we did notice, was Billy loves sticks, and not the small kind!. He was most interested in the larger branches that had fallen in the wind and once he had hold of them was quite fixated by them. 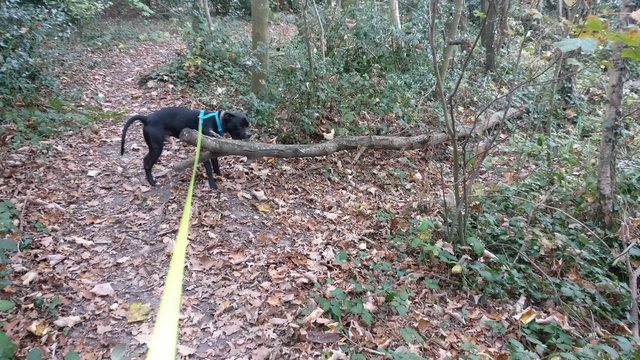 He is an intelligent boy and on our return back to kennels he stood and watched me clear the pathway of the branch he quite liked and once we had passed it, he found an even bigger tree trunk to munch down on! If he could pick them up and walk with them I think he would! Billy left and entered his kennel very calmly. A gent to walk! Billy was beautifully behaved on his walk today, showing off his dog friendly nature walking with Tia. Billy is such a handsome dude! Billy has been with me and Coco for the last couple of days, to give the young lad a break away from the kennel. Having read his history I was prepared for a dog with some behavioural holdovers from his previous life, however there really hasn't been anything that I have seen to indicate that he is troubled by his past. Massive kudos to his previous fosterer for his current healthy state. There have been a couple of little tiffs between him and Coco, but nothing that is beyond what I would expect from introducing two dogs to each other. Especially when one of the dogs is as....exuberant....as Coco. In his quest for inappropriate sticks he has managed to gouge a chunk out of his cheek and also got his head stuck in between two tree trunks that were growing in a V shape. He is quite a bright dog, just the thought of sticks seems to short circuit his common sense. As you can see from the pictures above, I've been walking Billy on the extender lead to give him the opportunity to roam a bit more freely and so I could see how his recall was. He's clearly not used to walking on an extender because we had more than one occasion where we were going round in circles around large trees trying to untangle each other. However, his recall on the extender seems pretty good, once again this is likely down to the care he has had from his previous foster. Eating: As a slightly sensitive tummy, but this may be down to a touch of normal kennel stress. Is slightly underweight. Sleeping/Crate: Snores, loudly. Doesn't like being in a crate overnight, whines and cries. Mouthing: Only one very, very minor bit of mouthing and immediately stopped with a firm "No"
Bad habits: None that I found, will steal food if it's in his reach, but has that in common with most dogs. EDIT He has a "thing" for soft toys like teddy bears and also cushions. It's easy to distract him with a treat and then remove the item from sight though. Car: Initially very reluctant to get in the crate in my car, however this has slowly improved. EDIT Now leaps happily into the crate in the car without issue. Treats: Can lunge for treats, however he takes them into his mouth carefully, a firm "gentle" to remind him does really help. He will calm down on the treats, once his tummy is better. Obedience: Knows "Sit" and will very vaguely "stay"
He has to go back to the kennel today, and we will all be sad to see him go. He is a lovely young dog with a great temperament and is incredibly loving and affectionate. Fingers crossed his forever home is really close, because he will make a great addition to any family.